Sorption chillers may still be a niche market, but Europe’s manufacturers reported rising demand for solar thermal cooling in Italy, Spain and the Middle East in 2017. Solar thermal numbers are on the rise because of three factors: the potential to reduce power consumption, including peak loads; the option to use natural refrigerants, such as water; and the ability to provide demand-responsive heating and cooling throughout the year. 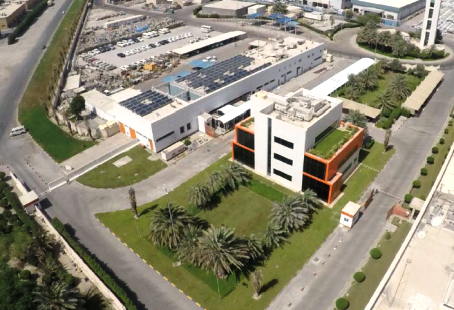 The photo shows the solar-cooled headquarters of Agility, a logistics business based in Kuwait. The 234 m² of evacuated flat plate collectors which provide the building with energy can be seen behind it. Mario Colaiemma, Executive Managing Director at Maya, the European distributor of Japanese Yazaki chillers, reported the commissioning of nine solar thermal cooling installations in 2017, a considerable increase over the two systems which the company had installed in Italy in 2016. Six of the new ones were set up in Italy and three in Spain, the majority on commercial buildings. All were connected to collector fields and combine solar cooling with hot water, space heating or both. In the Middle East, several countries and regions, including Kuwait, Saudi Arabia and the Emirate of Dubai, have announced a gradual removal of subsidies for electricity. This, in turn, will generate demand for renewable cooling solutions, as air conditioning is the number one cost factor on private and commercial electricity bills. “We’ve received an increasing number of requests from potential clients in the Middle East,” Bashir Kanawati, Sales Engineer for this region at German chiller manufacturer Fahrenheit, said. In 2017, his company installed a 10 kW sorption chiller at an energy recovery facility in Dubai and it is planning to erect a second demonstration plant at Qassim University in Saudi Arabia. He said that the chiller would be delivered in June and the system would start operating this year. Also read the news about Germany’s solar cooling market.